VersiSure Shaft Seals are able to satisfy any shaft seal application with our different drip-less seal models: DrySeal, Bellows, Gen II, and the Tri Seal. Each model is easy to install, requires little or no maintenance, and is sold as a complete kit – all backed by a three year warranty. Our products are used worldwide in both commercial, recreational and transportation vessels by owners who demand durability and reliability. All four models are designed for both aftermarket and new construction. VersiSure Shaft Seals are manufactured entirely in the USA, using only the highest-grade materials. We utilize advanced engineering and design to produce the finest shaft seals available. Our goal is to ensure water does not enter the bilge and stays outside of your vessel. 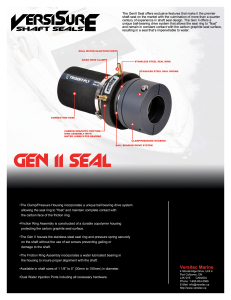 The GenII Seal offers exclusive features that make it the premier shaft seal on the market with the culmination of more than a quarter century of experience in shaft seal design. 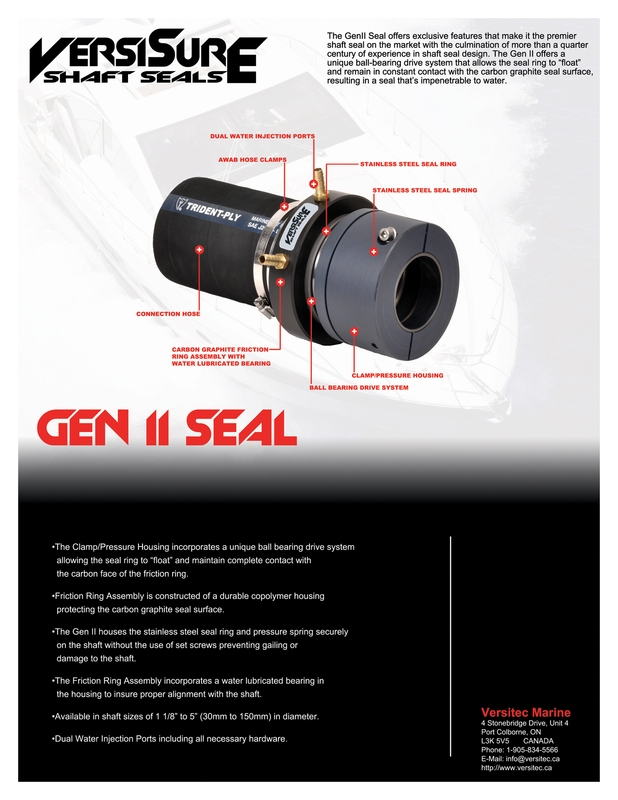 The Gen II offers a unique ball-bearing drive system that allows the seal ring to “float” and remain in constant contact with the carbon graphite seal surface, resulting in a seal that’s impenetrable to water. The Clamp/Pressure Housing incorporates a unique ball bearing drive system allowing the seal ring to “float” and maintain complete contact with the carbon face of the friction ring. Friction Ring Assembly is constructed of a durable copolymer housing protecting the carbon graphite seal surface. The Gen II houses the stainless steel seal ring and pressure spring securely on the shaft without the use of set screws preventing gailing or damage to the shaft. The Friction Ring Assembly incorporates a water lubricated bearing in the housing to insure proper alignment with the shaft. Available in shaft sizes of 1 1/8” to 5” (30mm to 150mm) in diameter. Dual Water Injection Ports including all necessary hardware. The Dry Seal is a compact economical lip seal designed for quick and easy installation. 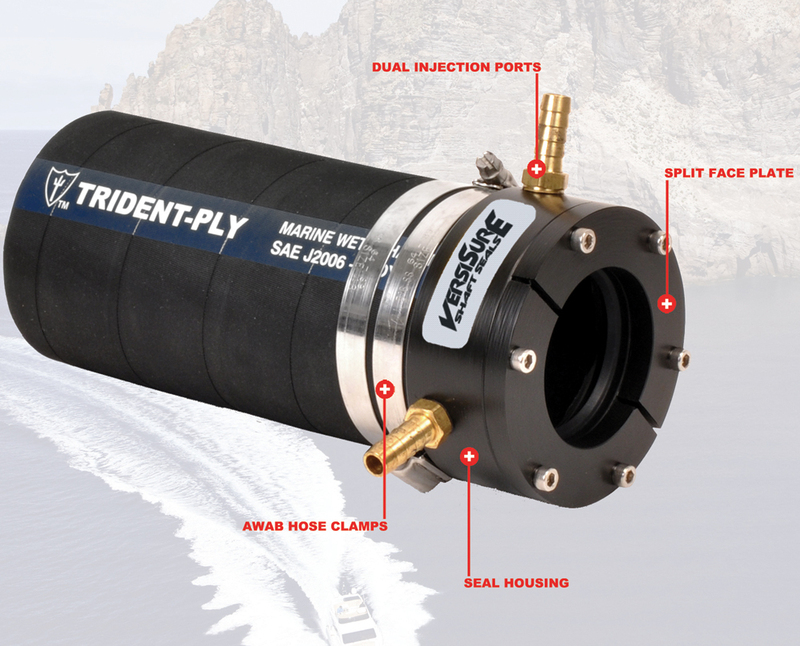 The lip seal, made specifically for marine use, is in constant contact with the propeller shaft, preventing the water from passing in your vessel. As in all our models, the Dry Seal incorporates a water lubricated alignment bearing in the housing to keep the unit properly aligned with the shaft. There is an optional back-up seal available that can be installed during the original installation, changeable in the future without the need to remove the shaft or unit. Split-face Plate makes it easy to replace inner lip seal without the need for special tools, and with an optional Back-up Seal. 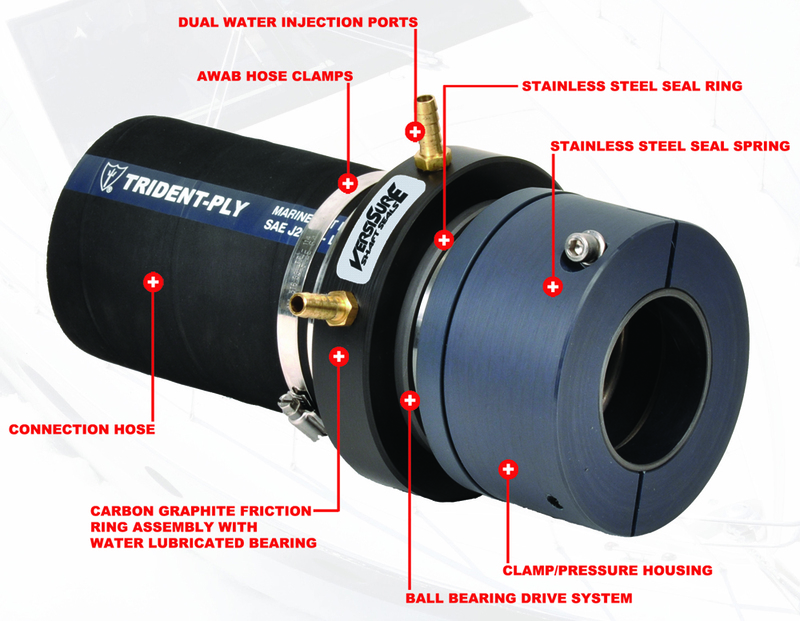 Seal Housing constructed of a durable copolymer with built in water lubricated bearing insuring proper alignment of the shaft. 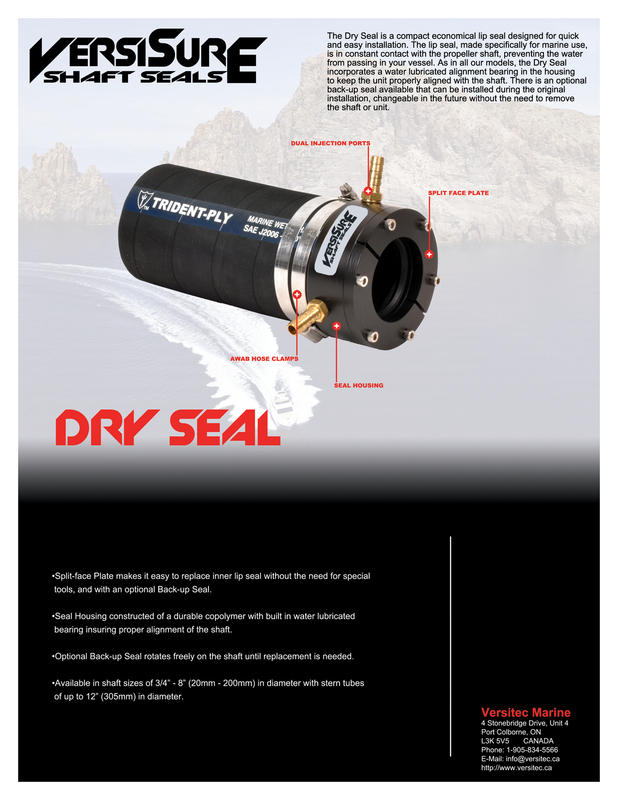 Optional Back-up Seal rotates freely on the shaft until replacement is needed. Available in shaft sizes of 3/4” - 8” (20mm - 200mm) in diameter with stern tubes of up to 12” (305mm) in diameter.